Channel 10 survey found 2 of 10 BtS claims of 'war crimes' were completely false, 2 exaggerated and 4 impossible to verify. Admit Deri, the head of Reservists on the Front, is pleased with a study released by Channel 10, showing that most of Breaking the Silence's claims of war crimes are baseless or invented. "The material they published affirms what we put forward. This is very serious research that was conducted by journalists who previously stated their support for Breaking the Silence, like Raviv Drucker. In the end it came out that the group does lie. In a sample of ten Breaking the Silence testimonies, the project found that two claims of beating detainees and shooting innocents were complete lies, two were exaggerated and four were impossible to verify. Only two of the ten were accurate." Deri feels that the message is clear: "We need to exclude this organization from all forums and not invite them to speak. I am happy that this is what's happening. In 2015 they didn't receive a single soldier's contribution, and this pulls the rug out from under them. We call on combat soldiers not to turn to them. This is the last place that should be resolving ethical issues. Today most combat soldiers understand their intentions and motivations." He acknowledges that the group will continue receiving money from abroad and working. "They receive financial support from foreign countries and organizations. They won't stop, but they won't have testimony. Most of the group's activists abandoned Israel for other countries and this says a lot. The difference between Breaking the Silence and B'Tselem is that Breaking the Silence uses combat soldiers in a cynical manner and takes advantage of them in order to advance goals that interest foreign elements. 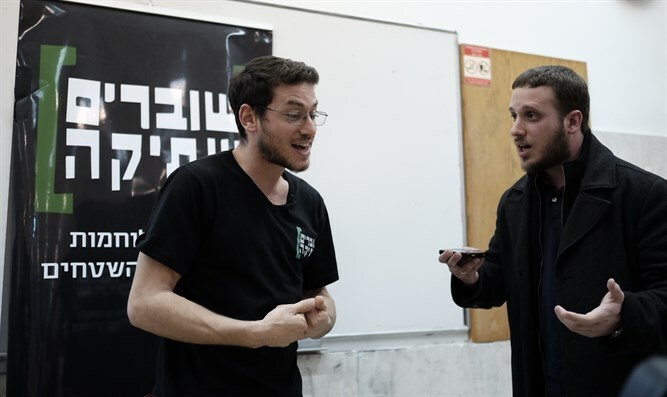 In comparison, B'Tselem works with Palestinians but hides its true intentions."